Boy Scout Jack Ringel put together the class as a part of his final Eagle Scout Project. Scout Oliver Fried leads the lecture from the front of the room. 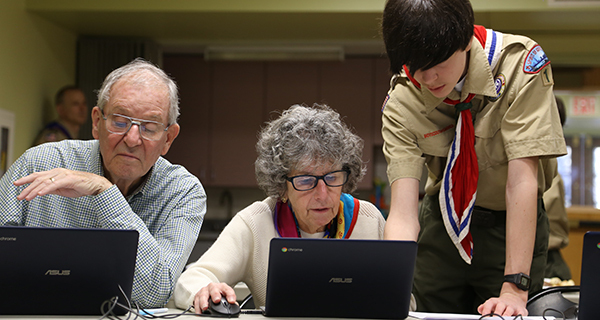 At the Dover Town Library on Saturday afternoon, members of the Dover Boy Scouts held a technology training session for visitors to the Dover Council on Aging as a part of Scout Jack Ringel’s final Eagle Scout project. With small laptops open before them, six seniors tried to follow along as five Boy Scouts talked them through the basics of how to operate a computer, covering everything from which buttons do what, what can be plugged into each port and why, and how to interact with a computer’s onscreen interface. 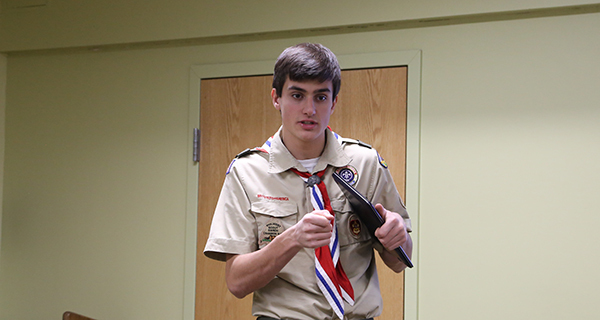 The class was put together by Jack Ringel, a Life Scout with the Troop 1 Dover Boy Scouts, and the project is the final step in his process towards becoming an Eagle Scout. The idea came to Jack from a similar program held at his school where seniors come in with individual tech questions and students help them, one-on-one. Instead of working on very specific individual questions, Jack got the idea to put together a class addressing the often overlooked basics of computer operation. What resulted was a syllabus broken into three one-hour classes: “Computer Navigation,” “Using the Internet,” and “Phone and Other Devices,” the first half of each being dedicated to guided lecture, the second being saved for individual help from the Scouts. Working with the Dover Council on Aging to advertise, and the Dover Library to organize the space and technology for the event, Jack and the Troop 1 scouts will be putting on two more classes over the next three months.